18, 20, 22 Ewe Boon Road. 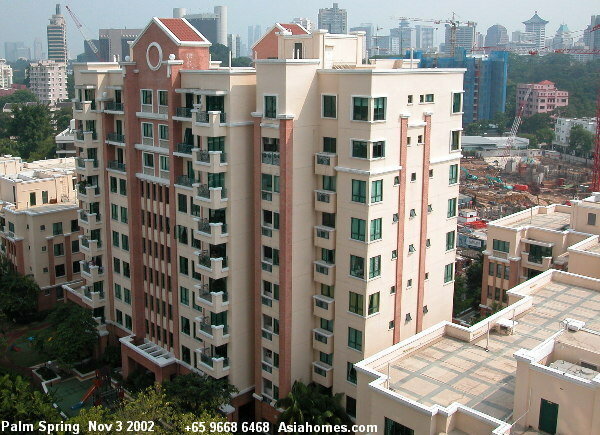 Freehold condominium. Completed: around July 1997. 167 units. Living/dining - marble tiles. Bedrooms - parquet. Swimming pool, children's pool, squash court, tennis court, gym. Barbecue area is away from the pools and is near the children's playground. Covered car park, jogging track of soft padded rubber flooring. Fitness area. Big waterfall pool at basement adds a resort ambience. Quiet, low rise resort ambience, full condo facilities. High quality finishes of the master bathroom impress Caucasian tenants. 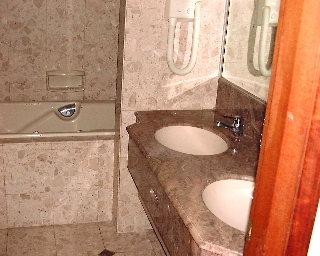 Jacuzzi long bath, hair dryer, marble tiled floor and wall, shower stall (left, not visible). A 5-min drive to downtown Orchard Road, 10 -min drive to the new French school at Ang Mo Kio and other international schools. 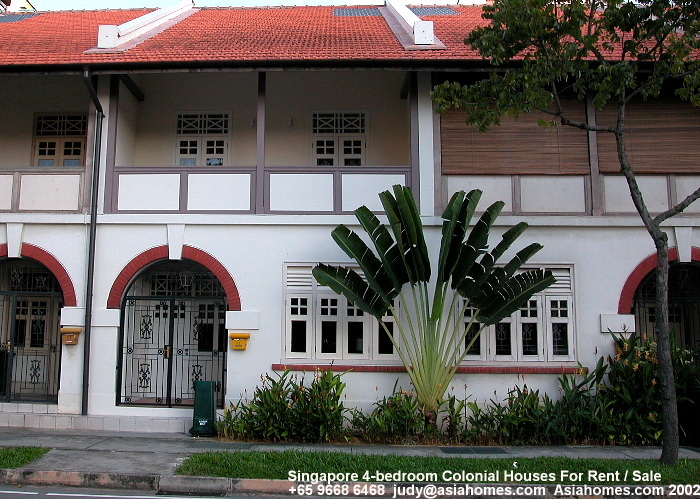 A 10-min walk away from the main Bukit Timah or Stevens Road. Small balconies. 4 stories in most blocks but 10 stories in Blk 18 facing pool. Low rise and low density. Cream coloured marble flooring. 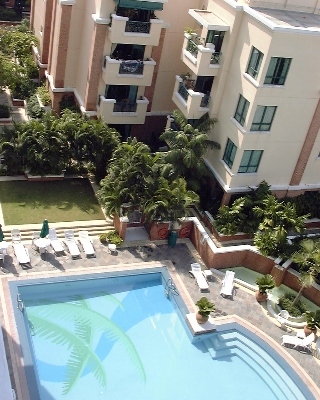 Big pool & balconies are assets favoured by Caucasian tenants. Blk 18 is on left. One tennis court, 24-hour security system. Panic buttons in master bedroom & kitchen. Audio visual intercom. Investors to note: These freehold condos are a 10-minute walk from the main road. Yet they are in great demand by Caucasian families owing to its good location, landscaped grounds, low rise and low density, sprawling ground with balcony concept. Some features are found in the newer 99-year leasehold Duchess Crest condos and they do attract a very high percentage of Caucasian families with young kids. Ground floor are rented out within a week or two. Disadvantages: You may need to walk 10 minutes to the main Bukit Timah Road. There are buses going to Orchard Road or Suntec City, b ut you are not living near a subway. Taxis are available as this location is close to the Newton area and Stevens Road, leading to Orchard Road. The kitchen in some units is dark due to insufficient natural lighting and lack of windows. Many other condos close by. Very small dining area in some 3-bedroom units, sufficient to install a dining table for four. 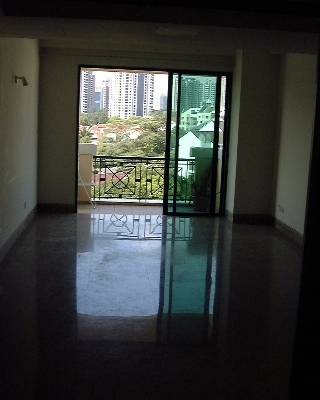 In some 3-bedroom units, the dining area is very small. A bigger table will obstruct the entry into the passage to the bedrooms (left of image). The main door is at the bottom of the image. Unblocked city views from Blk 18A high floor. Advert by Realtor: Palm Spring 4-bedroom 2411 sq ft $7,000. "I like the 40-year old Filipino maid" said the Asian-American wife who felt the urgent need to get a maid. The new Woodlands house gets dusty every day despite the closed doors and she needs mopping daily to remove the dust. Woodland housing near the American School still has a lot of construction of new lots and dust is to be expected. However, she was informed that the maid had to be sent home first by the British couple (since the pregnant wife had decided) and then come back again. The maid's salary has been S$450/month, every Sunday and public holidays (around 10) being her off-days. She would have to resign as she could not cope with the moods of the new mum and was prepared to take $400. Later in the evening she phoned and said that if she had to entertain guests, the maid would not be around and changed her mind! Singaporean employers pay around S$320 for a new Filipino maid, inexperienced permitting 2 Sundays off per month. Some Caucasian employers have generous pay and off days and maids do not work after 5 p.m. There are Caucasians who adopt the local practices too. salary: S$300 or S$320 (2 Sundays off). Monthly cost to employer excluding agency fee, food, accommodation and air-fare home at the end of 2-year contract is from S$650. Services to meet the maid on arrival at the airport and looking after her welfare till handing over to the new employer. Follow-up services for the new maid. Government's guarantee $5,000 (forfeited if the maid becomes pregnant or is not repatriated - some maids run away). Hospital & surgical expenses of $5,000. Wage compensation of $30/day (max. 30 days). Why are some agency fees payable by the Employer lower than others? Agent in Philippines charges $400 and get another 6 months' salary from the maid when she works in Singapore. Total charges paid by the maid amount to around S$2,200. Singapore agent charges $1,400 (no other hidden cost) to employer. Employer pays a total of $1,600 to agent and recover $600 from maid's 2 months' salary. The Employment Agent in Singapore charges maid $300. The maid saves as much as $2,200 less $600, a hefty savings of $1,600 but the net cost to the employer (if the maid stays at least 2 months) will be $1,000. There are various formulae. Just be cautious and get a good agent. In 2011, the situation has changed considerably. Consult a good employment agent. House-hunting for a 2-bedroom condo on 8 Jan 2000.